Get up and running in no time with this pedalboard, power supply and cable kit. 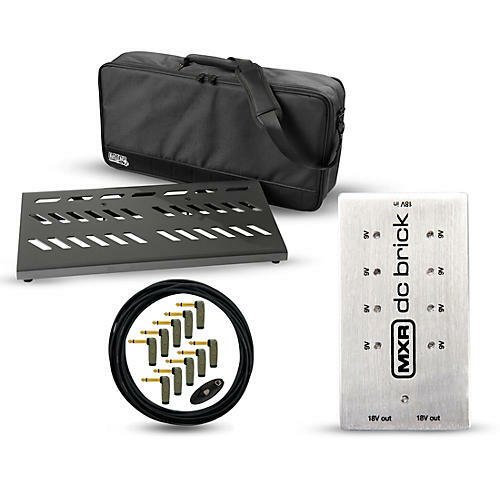 This all-in-one pedalboard package includes everything you need to get your board up and running, including a Gator Cases Gator Pro Aluminum Pedalboard with Case, an MXR DC Brick Power Supply, and a Planet Waves Cable Station Pedalboard Cable Kit. The Planet Waves Cable Station Pedalboard Cable Kit helps you to get rid of signal loss and unwanted coloration of your sound from inferior patch cables. The kit comes with 10' of cable, 10 right-angle plugs, and a Planet Waves mini cable cutter. Planet Waves Cable Station cables and 24k gold-plated plugs are specially designed for the most reliable, accurate reproduction of your sound from guitar to amp and everywhere in-between. Pedal surface measures 23.75 x 10.66 in.